Economists are obsessed with efficiency which means* the maximum production of goods and services as measured at market prices. Maximizing GDP is the most common form of efficiency worship. The most popular economics textbook, by Greg Mankiw begins by laying out “Ten Principles of Economics [which] offer an overview of what economics is all about.” The first principle is, “People Face Tradeoffs.” One of the first examples is the tradeoff “between efficiency and equity” (page 5). Mankiw generally comes down on the side of greater efficiency at the expense of equity. Matt Nolan agrees and gives a philosophical claim for why economists should focus on efficiency over equity: “the idea of equity is normative… [This is] why economists ignore it and focus only on the aspects of ‘efficiency’.” He claims that we have to distinguish “objective measures of efficiency” from “subjective measures of equity”. This is completely wrong. First of all, efficiency is just as much an ethical goal as equity. When Matt says things like, “the ‘efficient’ solution is the optimal solution,” he is making a normative judgement about what is “optimal.” Secondly, he claims that inequality is subjective, but we can measure inequality just as objectively as we can measure GDP which is a peculiarly subjective measurement of efficiency. For example, the protocols that rule GDP measurement make the ethical judgement to not value the negative effects of pollution. Economists are simply wrong to claim that efficiency is a less normative criteria than equity. Thirdly, normative judgements are impossible to avoid, so you have to be suspicious of anyone who claims that they have “better” judgement for no other reason than being more objective. Objectivity itself is subjective! 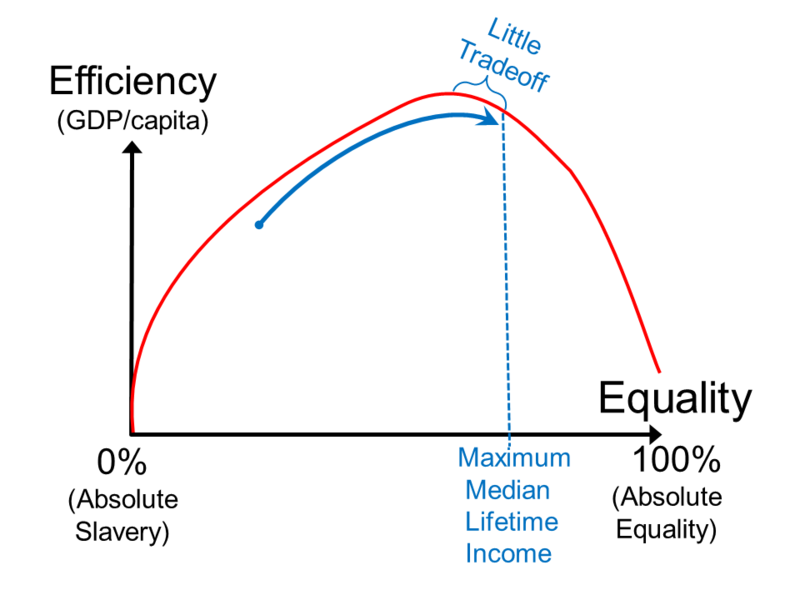 The idea that there is a tradeoff between efficiency and equity was the subject of an influential book (1975) by Arthur Okun in which he labeled it “The Big Tradeoff.” Mel Lorenzo Accad wrote that “The classic trade-off between efficiency and equity predates humanity itself.” This is a misleading false dichotomy. Obviously a tradeoff is inevitable at one end of the equality spectrum where there is perfect equality of income. If everyone had exactly the same income regardless of what they did, there would be little incentive to do difficult work for others and very little work. So absolute equality of income is inefficient (and it isn’t fair either, so it doesn’t really fit the dictionary definition of ‘equity’**). But at the other end of the spectrum, if there were absolute inequality, the economy would also be incredibly inefficient. Everyone would starve to death except for one person. Of course, if the one person could own everyone else as slaves, that could help because he would want to keep his slaves alive. But a slave society is still much less efficient than a free society because slave societies don’t invest enough in human capital and innovation. The misconception that there is an inevitable tradeoff between equality and efficiency is even perpetuated by people who argue for greater equity. For example, by far the most popular YouTube video about inequality focuses solely upon fairness and ignores the efficiency problems even though it is anti-inequality. The most popular YouTube video that is in favor of inequality says that it increases efficiency. This idea is endemic in mainstream (mmutilitarian) economics. Fortunately, there isn’t always a tradeoff between efficiency and equity because inequality can get inefficiently high. Every government does things to increase equity that also increase efficiency. The economics textbooks almost completely ignore this, but almost all of our public goods, from roads to basic sanitation to NOAH weather forecasts increase efficiency and equity. Universal public education, healthcare, and police protection are both efficient and equitable in rich nations. Even progressive taxation is efficient because it would be impossible to afford important public goods without it. For example, America would have lost WWII if we had had a flat or regressive tax because we simply couldn’t have raised enough money to pay for the war without raising taxes on the wealthy who had most of the money. The top tax rate was raised to over 90% to pay for the war and stayed there for decades as the war debt was paid down. On the other hand, there are also some policies like Social Security that do pose a tradeoff which increases equality and reduces efficiency. After all, Social Security increases retirement which is inherently inefficient. It would be more mmutilitarian efficient if people would just die once they stop producing goods and services. It is arguable whether Social Security is less efficient than a privatized pension system, but even in the worst-case argument, it doesn’t produce enough inefficiency to prevent it from being one of America’s most popular government programs. Markus Brückner and Daniel Lederman found that higher inequality reduces efficiency in high-income nations by reducing investment in education and other forms of human capital. Gary Becker argued that human capital is the main form of wealth in rich nations and high inequality reduces the opportunity of poor and middle-income people to afford education. On the other hand, they find that poor nations with higher inequality have had higher growth, so according to their study, poor nations have been on the right side of the curve and rich nations have been on the left. I’ll follow up with more examples in my next post. *Economists sometimes like to pretend that they define ‘efficiency’ as Pareto efficiency, which is less objectionable in theory because it literally means that nobody objects. But it is useless for any real-world application because someone always objects. Pareto efficient should be renamed ‘status-quo efficient‘ because it is the idea that the status quo is “optimal” if anyone has any objection to change, no matter how minor. That makes Pareto efficiency useless for any real-world application because it requires universal assent to change the status quo and if everyone already agrees, then economists can’t offer any additional expertise to help sort things out. That is why economists always use the mmutilitarian definition of efficient for all real-world applications. **Perfect equality of income is unfair because workers should be compensated for doing particularly unpleasant, difficult work. This is easily illustrated with utilitarian logic. Utilitarians are often wrongly accused of advocating for perfect equality of income, but what some of them really wanted was perfect equality of utility, not income. If some workers lose utility by doing difficult work rather than something more pleasant, the utilitarians thought they should be compensated with greater income so that they could recoup the foregone utility in other areas of life. Sarcasm Marks? ¡¿We Don't Do No Stinking Sarcasm!